Interstate Battery Review: Ask an EV driver! Hey, can you tell an Interstate battery from a US Battery? Sorry, that was a trick question! ... but the Interstate battery (if you also count the US Battery statistics) is still the second-most popular brand of electric car battery on the EV Photo Album, so I decided to have a chat with a few of the EV owners to see why they chose them, and if they're happy with the batteries. 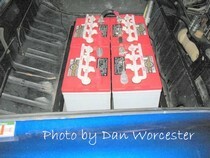 His batteries: Interstate PFGC2, 6-volt flooded lead-acid battery, 72v system. Bill: My primary consideration was the fact that I was able to get a set of them for a greatly reduced price through Sam's club. I paid about $70.00/batt for a 200AH battery. Also I have some experience with these batteries from my golf cart. Out of 12 I did have one failure, and I'll be exchanging it tomorrow. I'll let you know if I have any trouble replacing it. Me: (Next day) Did they replace it? Bill: No problem! Sam's club exchanged it without question. I charged up and went for a drive, everything works fine now. His batteries: The US8VGCHC, 8-volt flooded lead-acid, 144v system. Me: Why did you choose Interstate batteries? Craig: I have a local connection with a distributor and wanted a local connection if I had problems. Why 8-volts? EV America ran the numbers on the truck with both these batteries and 20 six volts (making a 120v system). 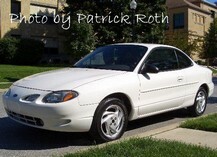 I like the 144v performance numbers, and the range was not affected much (so I went with it). There's about a 10% reduction in cycle life. The truck will have a 30 mile round-trip commute, and I wanted to make sure no one complained about being stuck behind me. The batteries are in the truck but it's not on the road yet, I'm still wiring up the batteries. I'll be on the road in a month or so. His batteries: The US8VGCUT, 8-volt flooded lead-acid, 96v system. Dan: I work for a company that buys tons of regular batteries from a local distributor. He gave me the 8 volt traction batteries for below cost. He also ordered a pallet for me so all 12 are the exact same date code! They also have a 99.99% recycling center at the store, so my batteries will go back to use when I need the next set. I would have love to have gone with sealed units to avoid the maintenance and the vapors (I also had to buy 120V fans to run while the car is charging this weekend), but they didn't meet my range requirements. They have worked quite well and no cell failures or any problems after 6 months and about 2500 miles. Just this weekend I upgraded to the latest Zivan high frequency charger that has faster response and should be easier on the charging cycle. Now that I have the new high frequency charger, the batteries are responding correctly because they are getting fully charged, and range is better. The old version never reached 100% when plugged in during the day. His batteries: Interstate battery 29 DC-1, 12 volt Marine Deep Cycle, 72v system. Me: The batteries didn't work out? ...just the marine deep cycle I used were not suitable. I am now experimenting with lithium batteries. 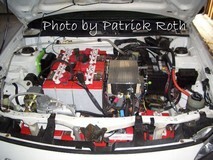 His batteries: Interstate battery US8VGC, 8 volt flooded lead-acid, 120v system. The 8-volts were a compromise on size, number and weight. I wanted a 120v system but didn't want to add the weight of 6-volt batteries (or have to find space for 20 batteries!). I also felt that 12-volts wouldn't give me the range I wanted, so I compromised with 8-volts. I like the performance and range I'm getting. It's been a good trade off. Back to Electric Car Batteries.